Typically, you use an IPSec subnet VPN to create a secure, encrypted tunnel between subnets, such as between two Smoothwall System appliances located at a head office and a branch. Passing IPSec traffic through any NAT-ing device such as a router (or a separate firewall in front of the VPN gateway/client) can cause problems. IPSec normally uses Protocol 50 which embeds IP addresses within the data packets – standard NAT-ing will not change these addresses, and the recipient VPN gateway will receive VPN packets containing private (non-routable) IP addresses. In this situation, the VPN cannot work. However, the Smoothwall System can operate in IPSec NAT Traversal (NAT-T) mode. NAT-T uses the UDP Protocol instead of Protocol 50 for IPSec VPN traffic – UDP is not affected by the NAT process. This does of course require that the other end of the VPN tunnel supports NAT-T. SSH Sentinel supports this mode, as do the vast majority of other modern VPN gateway devices. Note: Any IPSec VPN client connections from a local network behind the Smoothwall System that connect to another vendor's VPN gateway will also need to use NAT-T rather than Protocol 50 for the reasons stated above. Note: NAT-T is a VPN gateway feature, not a NAT-ing feature. 1. From the primary Smoothwall System, create a local Certificate Authority — see Creating a Certificate Authority . 2. From the primary Smoothwall System, create certificates for the primary Smoothwall System, and remote appliances, including non-Smoothwall appliances — see Managing Certificates . 3. Set the default local certificate for the primary Smoothwall System — see Setting the Default Local Certificate . 4. From the primary Smoothwall System that points to the remote host, go to Network > VPN > IPSec subnets. • Name — Configure a meaningful name for this VPN. • Enabled — New VPNs are enabled by default. Clear the check box to create a disabled VPN. • Local network — Enter the local subnet that the remote host has access to, using the format: <IP_address>/<network_mask>. Uses the subject field of the default local certificate as the local certificate ID. Uses the local IP address of the host as the local certificate ID. Uses a user specified host and domain name as the local certificate ID. Uses a user specified IP address name as the local certificate ID. Uses a user specified email address as the local certificate ID. Uses a user specified certificate subject as the local certificate ID. Note: Typically, user specified ID types are used when connecting to non-Smoothwall VPN gateways. For more information regarding the required IP types, including the formatting required, refer to your vendor's documentation. • Local ID value — If the Local ID type is user defined, enter the host and domain name, IP address, email address, or certificate subject as required. Typically, you can leave this field blank because the value is automatically retrieved during the connection process, according to the chosen Local ID type. • Remote IP or hostname — Enter the remote host’s IP address or hostname. You can leave this field blank is the remote host uses a dynamic IP address. • Remote network — Enter the remote subnet that the local host has access to, using the format: <IP_address>/<network_mask>. The remote ID is the remote IP address, or any other form of presented ID. Allows the user to specify a custom host and domain name that it should expect the remote gateway to present as ID. Allows the user to specify a custom IP address that it should expect the remote gateway to present as ID. Allows the user to specify a custom email address that it should expect the remote gateway to present as ID. Allows the user to specify a custom certificate subject string that it should expect the remote gateway to present as ID (typically used for non-Smoothwall System VPN gateways). • Remote ID value — If the Remote ID type is user defined, enter the host and domain name, IP address, or certificate subject as required. For a detailed description of using preshared keys, see About Pre-Shared Key Authentication. For a detailed description of using certificates, see About X509 Authentication. • Preshared key — If Preshared key is the authentication method, enter the key. • Preshared key again — Re-enter the preshared key. Do not copy and paste from the previous field. • Use compression — Select to compresses tunnel communication. This is useful for low bandwidth connections, but it does increase CPU utilization on both host systems. The benefits of compression also vary depending on the type of traffic that will flow through the tunnel. For example, compressing encrypted data such as HTTPS, or VPN tunnels within tunnels may decrease performance. The same rule applies when transferring data that is already compressed, for example, streaming video. For any tunnel with a high proportion of encrypted or already-compressed traffic, compression is not recommended. For non-encrypted, uncompressed traffic compression is recommended. This setting must be the same on the tunnel specifications of both connecting gateways. • Initiate the connection — Select to enable the local VPN system to initiate this tunnel connection if the remote IP address is known. 6. If additional settings are required, click Advanced. Note: Typically, advanced settings are used for compatibility with other VPN gateway systems, although they can be tweaked for performance gains in Smoothwall System to Smoothwall System VPN connections. • Perfect forward secrecy — Select to enable the use of the prefect forward secrecy (PFS) key establishment protocol, ensuring that previous VPN communications cannot be decoded should a key currently in use be compromised. PFS is recommended for maximum security. VPN gateways must agree on the use of PFS. Encapsulating Security Payload (ESP) uses IP Protocol 50 and ensures confidentiality, authenticity and integrity of messages. Recommended for optimal performance. IP Authentication Header (AH) uses IP Protocol 51 and ensures authentication and integrity of messages. This is useful for compatibility with older VPN gateways. Because AH provides only authentication and not encryption, AH is not recommended. A triple strength version of the DES cryptographic standard using a 168-bit key. The 3DES is a very strong encryption algorithm though it has been exceeded in recent years. It is the default encryption scheme on most VPN gateways and is therefore recommended for maximum compatibility. Advanced Encryption Standard replaces DES/3DES as the US government’s cryptographic standard. AES offers faster and stronger encryption than 3DES. Advanced Encryption Standard replaces DES/3DES as the US government’s cryptographic standard. AES offers faster and stronger encryption than 3DES. It is recommended for maximum security and performance. A cryptographic hash function using a 128-bit key. Recommended for faster performance and compatibility. Secure Hashing Algorithm uses a 160-bit key and is the US government's hashing standard. Recommended for maximum security. • Key life — Configure the length of time, in minutes, that a set of keys can be used for. After the Key life value has expired, new encryption keys are generated, reducing the threat of snooping attacks. The default, and maximum, value of 60 minutes is recommended. • Key tries — Configure the number of connection attempts before failing. The default value of 0 allows the host to continuously re-key the connection. However, a non-initiating VPN gateway should not use the default value as the connection cannot be initiated. • IKE lifetime — Configure the length of time, in minutes, the Internet Key Exchange (IKE) keys are re-exchanged. • Do not rekey — Select this option to disable re-keying. This can be useful when working with NAT-ed end points. • Local internet IP — Optionally, enter the IP address of the network to use when the Smoothwall System itself sends traffic in the tunnel. Note: Many parameters are used when creating an IPSec site-to-site VPN tunnel. 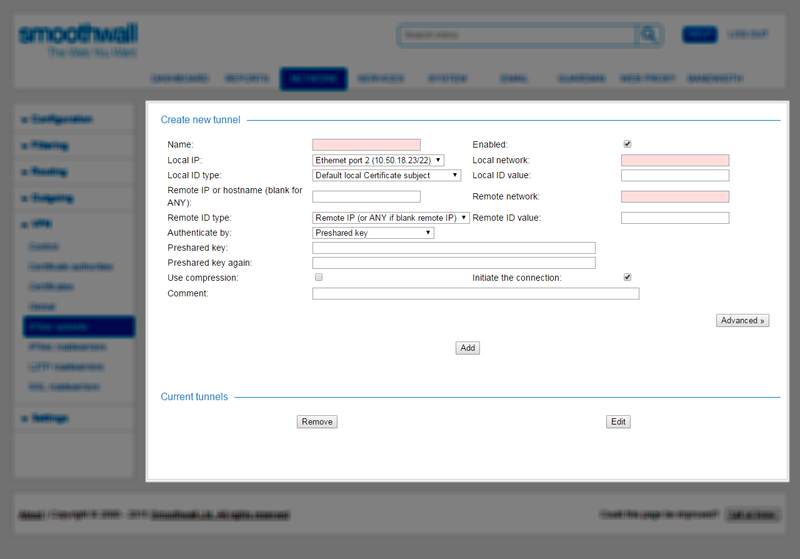 For Smoothwall System to Smoothwall System connections, many settings can be left at their default values. However, for maximum compatibility with other VPN gateways, some settings may require adjustment. This section describes each parameter that can be configured when creating an IPSec tunnel. For more VPN tutorials, see VPN Tutorials. 9. Export the Certificate Authority certificate, and the remote host’s certificate from the primary host — see Exporting the Certificate Authority Certificate, and Exporting Certificates. 10. From the remote host, import the Certificate Authority certificate exported in step 9. For a detailed description of how to import certificates, see Importing Another Certificate Authority's Certificate. 11. From the remote host, import and install the Smoothwall System’s certificate exported in step 9. For a detailed description of how to import Certificate Authorities, see Importing a Certificate. 12. From the remote host, create a tunnel using the same settings as configured on the primary Smoothwall System. If the remote host is another Smoothwall System system, repeat steps 4 to 8, but on the remote host. 13. Initiate the connection from the remote host. If the remote host is a Smoothwall System system, go to Network > VPN > Control, else skip to step 16. 14. From the IPSec subnets panel, locate and highlight the relevant VPN. 15. Click Up. The tunnel is initiated. 16. Ensure appropriate zone bridging rules are configured and active in order to allow traffic to and from the VPN tunnel. For more information, see About Zone Bridging Rules . For VPN tutorials, and troubleshooting tips, see VPN Tutorials. This example explains how to create a site-to-site IPSec tunnel using X509 authentication between two Smoothwall Systems. 2. Create certificates for the local and remote systems using Host and Domain Name as the ID type, for information about how to do this, see Managing Certificates . 3. Install the local certificate as the default local certificate on the local system, for information about how to do this, see Importing a Certificate. 4. Export the Certificate Authority certificate in PEM format, for information about how to do this, see Exporting Certificates. 5. Export the remote certificate in the PKCS#12 container format, for information about how to do this, see Exporting in the PKCS#12 Format. 6. Import and install the certificate as the default local certificate on the remote system, for information about how to do this, see Importing a Certificate. Enter a descriptive name for the tunnel. Select to ensure that the tunnel can be activated once configuration is completed. Specify the local network that the secondary system is able to access. This should be given in the IP address / network mask format and should correspond to an existing local network. For example, 192.168.10.0/255.255.255.0. From the drop-down list, select Default local Certificate ID. This will identify the primary system to the secondary system by using the host and domain name ID value in the primary system’s default local certificate. Its value is automatically retrieved by the Smoothwall System during the connection process. If the secondary system has a static IP address or hostname, enter it here. If the secondary system has a dynamic IP address, leave this field blank. Specify the network on the secondary system that the primary system is able to access. This should be given in the IP address/network mask format and should correspond to an existing local network. For example, 192.168.20.0/255.255.255.0. From the drop-down list, select User specified Host & Domain Name. Enter the ID value (the hostname) of the secondary system’s default local certificate. From the drop-down list, select Certificate provided by peer. This will instruct the Smoothwall System to authenticate the secondary system by validating the certificate it presents as its identity credentials. Select to reduce bandwidth consumption. This is useful for low bandwidth connections, however, it will require more processing power. Do not select. It is the responsibility of all secondary systems to initiate their own connection to the primary Smoothwall System system. Enter a descriptive comment. For example, Tunnel to Branch Office. The advanced settings are left to their default values in this example. The next step is to create a matching tunnel specification on the remote system. Specify the local network that the primary system is able to access. This will identify the secondary system to the primary system by using the host and domain name ID value in the secondary system’s default local certificate. Enter the external IP address of the primary system. Unlike the first tunnel specification, this cannot be left blank. The secondary system will act as the initiator of the connection and therefore requires a destination IP address in order to make first contact. Enter the network on the primary system that the secondary system is able to access. This should be given in the IP address/network mask format and should correspond to an existing local network. For example, 192.168.10.0/255.255.255.0. From the drop-down list, select User specified Host & Domain Name. This matches the primary system’s certificate type of Host and Domain Name, as listed in Example IPSec Site-to-Site and X509 Authentication Configuration. Enter the ID value (the hostname) of the primary system’s default local certificate. From the drop-down list, select Certificate provided by peer. This instructs the Smoothwall System to authenticate the primary system by validating the certificate it presents as its identity credentials. Select if you selected it on the primary system. Select as the secondary system is responsible for its connection to the primary Smoothwall System. Enter a descriptive comment, for example, Tunnel to Head Office. 2. Click Add. All advanced settings can be safely left at their defaults. Once the tunnel specifications have been created, the tunnel can be activated. To do this, first ensure that the VPN subsystem is active on both the primary and secondary systems. 1. On the primary system, go to the Network > VPN > Control page. 2. In the Manual control region, identify the current status of the VPN system. If the status is Running, you do not need to do anything. If the status is Stopped, click Restart. 3. On the secondary system, go to the Network > VPN > Control page. 4. In the Manual control region, identify the current status of the VPN system. If the status is Running, you do not need to do anything. If the status is Stopped, click Restart. Next, the secondary system should initiate the VPN connection. 1. On the secondary system, go to the Network > VPN > Control page. 2. In the IPSec subnets region, identify the tunnel that was just created and click its Up button to initiate the connection and bring the tunnel up. Note: In order to permit or deny inbound and outbound access to a site to site VPN tunnel, ensure that appropriate zone bridging rules are configured. For further information, see About Zone Bridging Rules . Pre-Shared Key (PSK) authentication is useful for creating a basic VPN site-to-site connection where there is no requirement for multiple tunnel authentication and management controls. From the drop-down list, select Local IP. This will identify the primary system to the secondary system by using the local IP address of the primary system’s external IP address. Leave empty. It is automatically generated as Local IP was chosen as the local ID type. If the secondary system has a static IP address or hostname, enter it here. If the secondary system has a dynamic IP address, leave this field blank. This should be given in the IP address / network mask format and should correspond to an existing local network. For example, 192.168.20.0/255.255.255.0. From the drop-down list, select Remote IP (or ANY if blank Remote IP). This will allow the primary system to use the secondary’s IP address (if one was specified). Enter the local IP address of the secondary system. From the drop-down list, select Preshared Key. This will instruct the Smoothwall Systemto authenticate the secondary system by validating a shared pass phrase. Re-enter the passphrase to confirm it. Select this option if you wish to reduce bandwidth consumption. It is useful for low bandwidth connections but requires more processing power. Do not select this option. It is the responsibility of all secondary systems to initiate their own connection to the primary Smoothwall System. 2. Click Add. All advanced settings can be safely left at their defaults. The Smoothwall System lists it in the Current tunnels area. The next step is to create a matching tunnel specification on the remote system. Specify the local network that the primary system is able to access. This should be given in the IP address/network mask format and should correspond to an existing local network. For example, 192.168.10.0/255.255.255.0. Enter the external IP address of the primary system. Unlike the first tunnel specification, this cannot be left blank. The secondary system will act as the initiator of the connection and thus it requires a destination IP address in order to make first contact. Specify the network on the primary system that the secondary system is able to access. This should be given in the IP address/network mask format and should correspond to an existing local network. For example, 192.168.10.0/255.255.255.0. From the drop-down list, select Remote IP (or ANY if blank Remote IP). This will allow the primary system to use the secondary's IP address (if one was specified). From the drop-down list, select Preshared Key. This will instruct the Smoothwall System to authenticate the secondary system by validating a shared pass-phrase. Enter the same pass-phrase as was entered in the Preshared Key field on the primary system. Re-enter the pass-phrase to confirm it. Select this option if compression was enabled on the primary system. Select this option as it is the responsibility of the secondary system to initiate its connection to the primary Smoothwall System.